SAN DIEGO (May 2, 2018) – The San Diego County Bar Foundation announced its 2018 Distinguished Lawyer Memorial inductees, recognizing recently deceased lawyers and judges of the San Diego County Bar who have demonstrated significant commitment to their communities as well as superior legal skills and high ethical standards throughout their careers. 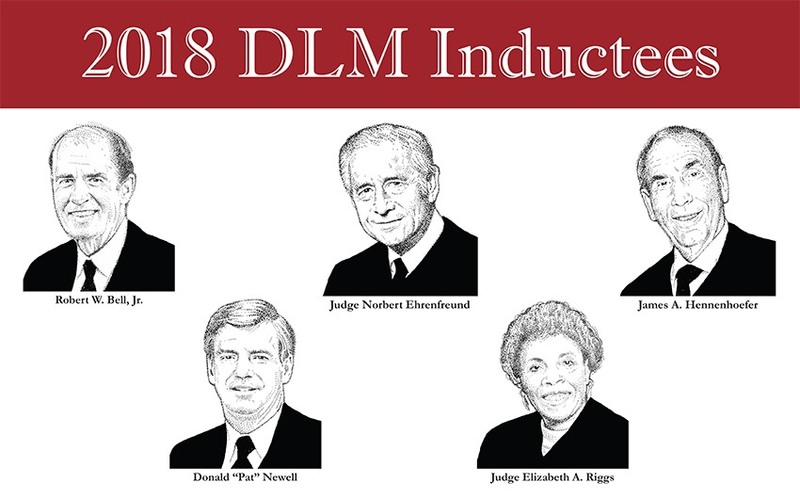 The Distinguished Lawyer Memorial Reception will be held at the University Club on Wed., May 23 from 5:30-7:30 p.m. Each inductee will be recognized with a permanent plaque in the Hall of Justice at the San Diego County Courthouse. Norbert Ehrenfreund – Before he was a judge, Ehrenfreund was in the military, taking part in the liberation of Nazi concentration camps and later, covering the Nuremburg trials for an American military newspaper. He was tapped for the bench by Governor Jerry Brown in 1975 and remained until his retirement from the Superior Court in 1995. His numerous awards and honors include “Trial Judge of the Year” by the San Diego Trial Lawyers Association and the Award of Judicial Excellence from the National Conference of State Trial Judges. Robert W. Bell, Jr. – Bell was an expert in California trials involving Title VII, the Civil Rights Act of 1964, believed by many to be the most important U.S. law enacted in the 20th century. He was a highly regarded member of the San Diego legal community, collecting honors and appearing in “The Best Lawyers in America” and “San Diego Super Lawyers.” He served on the board of the Legal Aid Society of San Diego for 37 years, providing expertise and legal services to low-income San Diegans. James Hennenhoefer – Hennenhoefer practiced family law for 46 years in San Diego, earning numerous accolades at the local, state, national and international levels. He was active duty, serving in the Vietnam War, and retired from the Naval Reserves in 2001 with the rank of commander. With a soft spot for fellow service members, Hennenhoefer never missed the chance to assist his fellow military brethren. He taught classes on electronically stored information to lawyers and judges and was appointed to the California State Bar Judicial Nominees Evaluation Committee in 2016. Donald “Pat” Newell – Newell, one of the leading California corporate lawyers of his generation, was a mentor, leader and active participant in the business community. He became Latham & Watkins’ San Diego office managing partner in the mid-1980s, and Newell’s career, spanning nearly 40 years, is a testament to his success. In addition to serving as articles editor for the “California Law Review” and chairman of the Business Law Section of the State Bar, Newell was an avid supporter of pro bono legal work. Colleagues, friends and families of honorees have made donations to the Distinguished Lawyer Memorial, benefiting the San Diego County Bar Foundation and the law-related organizations it supports that serve the disadvantaged in the local community. To make a contribution to the Memorial or in recognition of one of this year’s honorees, visit https://sdcbf.org/donatedlm, call 619-231-7015 or email info@sdcbf.org. The San Diego County Bar Foundation (SDCBF) is the charitable arm of the San Diego County Bar Association (SDCBA). Through this partnership with the San Diego County legal community, SDCBF aims to benefit underprivileged communities in the region, by providing them with access to support, funding and public service programs with legal services. The foundation’s beneficiaries include more than 50 legal aid and public interest organizations. For more information, visit www.sdcbf.org. No Replies to "San Diego County Bar Foundation Honors 2018 Distinguished Lawyer Memorial Inductees"